Located in the Staffordshire potteries town of Hanley. The Grand Theatre of Varieties had a small corner entrance at Trinity Street and Foundry Street. It was opened on 22nd August 1898 and was used initially as a theatre for variety and circus performances. In October 1899 films were being screened as part of the variety programme. Designed by noted theatre architect Frank Matcham in a French Renaissance style. Seating was provided in orchestra stalls, pit stalls, dress circle, balcony and gallery levels, and in boxes at dress circle level on each side of the 32 feet wide proscenium. The stage was 44 feet deep. In 1919, the original Bioscope box was relaced with a newly built projection box. In February 1932 sound equipment was installed and the first talkie screened was Gracie Fields in “Sally in Our Alley”. 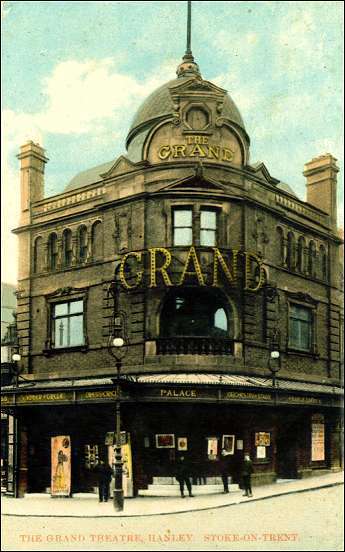 Sadly, the Grand Theatre was destroyed by a fire on 11th May 1932. The site was purchased by Oscar Deutsch to build his new Odeon Theatre, which opened on 13th February 1938. An old postcard view of the theatre can be seen here.